Wondering how your app is performing against others in your industry? Look no further! In this cheat sheet, we’ve provided benchmarks for the Gaming vertical based on our database of more than 37,000 apps. We’ve focused on benchmark data around several key metrics — app engagement, user retention and the impact of a mobile marketing strategy. The data is based on app usage in Q4 2015. 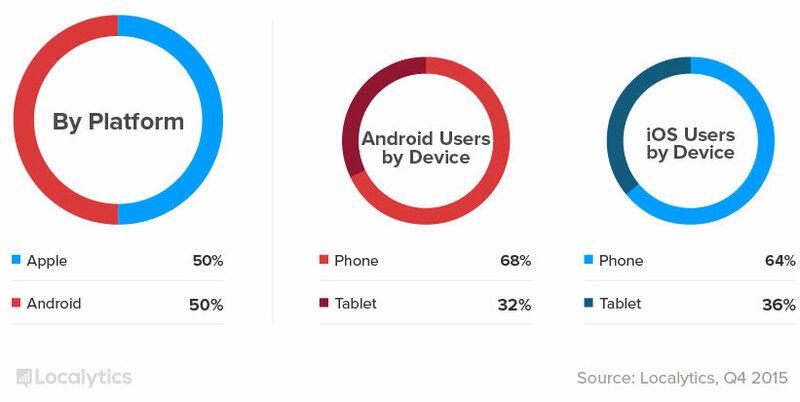 Use these stats to help define your mobile strategy’s focus – should you be focusing on Android or iOS, or on the smaller screen of a phone versus the large screen of a tablet? According to our data, 27% of users are still using Gaming apps one month after they downloaded it, meaning 73% of users have churned and are no longer using the app one month after they downloaded it. User retention can also be measured by number of sessions. The more sessions a user has, the more likely they are to become a loyal user. 33% of users only use Gaming apps once, while 27% of users return to the app for 11 or more sessions. App launches measures the average number of times a user visits a Technology App. In this version, we’re comparing users who have enabled, or opted in, to push notifications versus those who have opted out of push. Gaming app users who have push enabled average 11.3 app launches, while users who have push disabled only average 4.9 app launches. 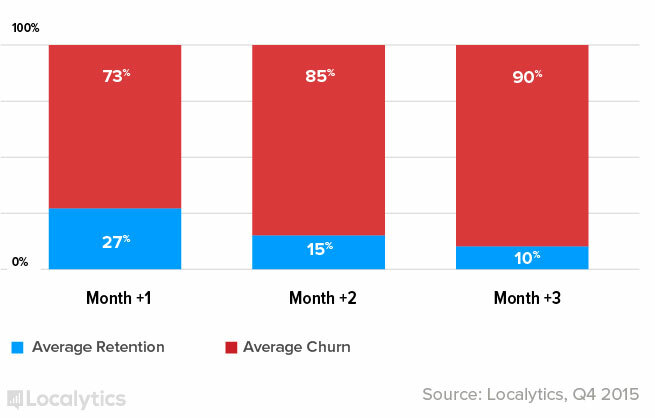 Retention measures the amount of users who return to a Gaming app one month, two months, and three months after they downloaded the app. In this version, we’re comparing users who have push notifications enabled versus those who have disabled push. 44% of push-enabled users return to the app one month after they downloaded it, while only 14% of users who did not have push notifications enabled returned in the same time period. 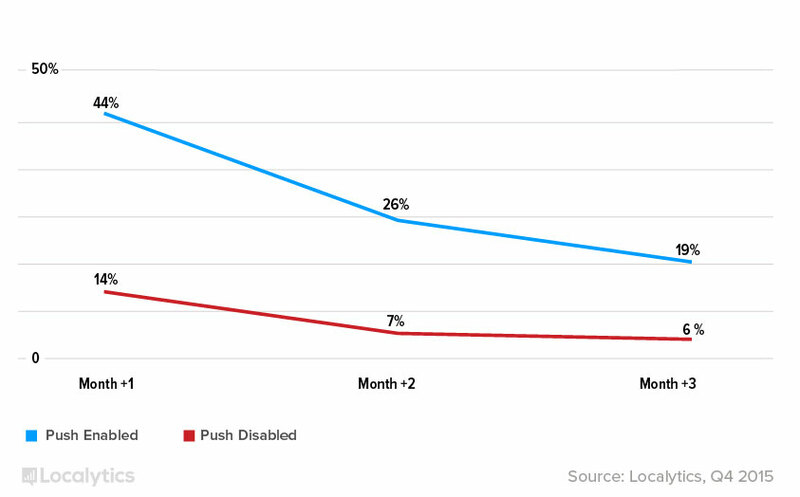 By the third month after download, 19% of push enabled users are still using the app, while only 6% of users who have disabled push are still using the app. 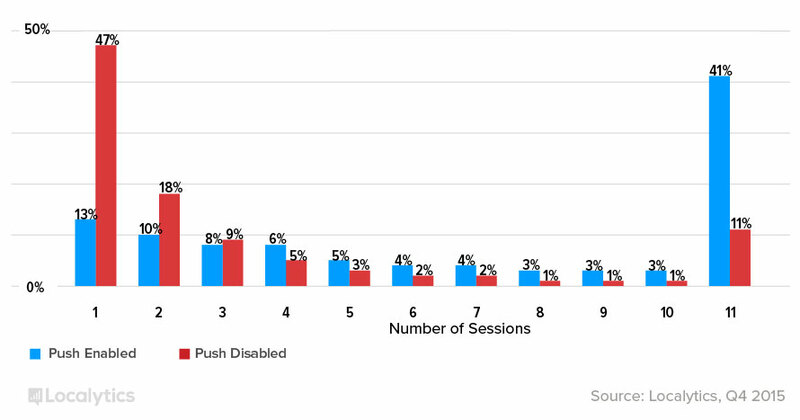 Another way to measure the effectiveness of push notifications is to see how many sessions users with push enabled log in Gaming apps compared to users who have push disabled. This measurement shows that the majority of users who do not have push enabled will only visit an app once. While users who do have push enabled are more likely to visit an app upwards of 11 times. 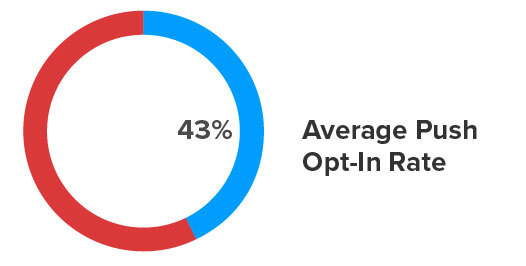 47% of users who have opted-out of push will only visit an app once. While only 13% of push-enabled users will visit an app once, meaning more users with push enabled will return to the app. In the long term, 41% of users who have opted-in to push visit an app 11 times, while only 11% of users who don’t receive push notifications used the app 11 times. Localytics is the leading mobile engagement platform across more than 2.7 billion devices and 37,000 mobile and web apps. The timeframe for this data is Q4 2015.